“Change the world one revolutionary idea at a time.” This is Accenture in the Philippines’ challenge to STEM (Science, Technology, Engineering and Mathematics) college students and fresh graduates as the “Program the Future: The Accenture Technology Campus Challenge 2016” returns for its third year. The company invites interested applicants to join and register at www.accenture.com/ProgramTheFuture until May 15, 2016. 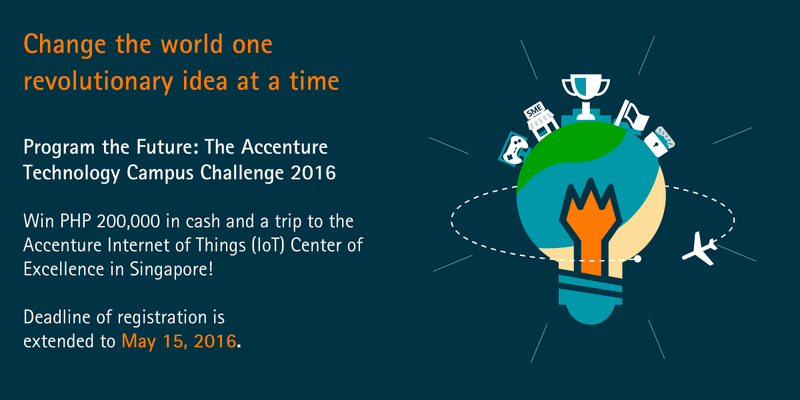 A cash prize of Php 200,000 and a trip to the Accenture Internet of Things (IoT) Excellence Center in Singapore are up for grabs.